To serve our residents as if we are caring for our own mothers and fathers. How do I start the conversation about assisted living with my loved one ? Talking with your loved one about a change to assisted living can be stressful and overwhelming for both of you. It must be handled with respect and dignity. Research your options ahead of time so you have some facts to present about the progression of any disease or the ability to live alone, as well as the assisted living communities available. Address their fear of loss of independence and loneliness. Let them help make the decision. Read More..
How do I choose the best community for my loved one? Research the options in your area that could accommodate your loved one. Tour each one and look at the care available and the care that is being given. What are the attitudes of the staff and residents? Are they friendly and accommodating or disinterested? Also check for activities that your loved one will enjoy. Is it bright and cheerful, are their smiles and laughter or is it dark and idle? Are residents content and positive or do they seem lonely and lost? Read More..
How do we afford assisted living? Assisted Living communities vary widely in cost depending on room size, services offered and other factors. Although private pay is the most common, there are other options: long-term care policies, Veteran’s Aid and Attendance Benefit, Medicaid or SSI. Tax deductions may be available for you. Be sure to ask the admissions director at your intended community for ideas on financial aid. Read More..
What is assisted living and how do I know it’s right for my loved one? 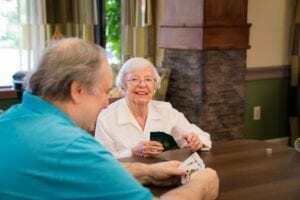 Assisted living communities are for people needing assistance with Activities of Daily Living (ADLs) but wishing to live as independently as possible for as long as possible. Assisted living exists to bridge the gap between independent living and nursing homes. Residents in assisted living centers are not able to live by themselves, but do not require constant care either. Read More..
See our beautiful community and hear our resident’s comments about the Inn. Tour our private suites, beautiful patio, great room and fireplace, dining room and more as you discover the splendor and warmth of The Inn at Belden Village. The best reference is from our residents and their families. If you are looking for the best Assisted Living Community, you might as well stop looking around; you will never find any place better than this. We’re all family here, and they treat us like kings and queens! I should know. I’ve lived here for nearly 8 years.